Check out our updated map! I couldn’t have asked for a more wonderful Thanksgiving. It was a cool day with some sun and just enough wind. Lee and I left Coinjock, NC around 8:30 in the morning and continued down the Virginia Cut portion of the ICW. My camera could not be resuscitated so it was frustrating to watch all the beautiful scenery going by without being able to take pictures. I tried to pay more attention to the sights, appreciating them in the moment rather than saving them for later. 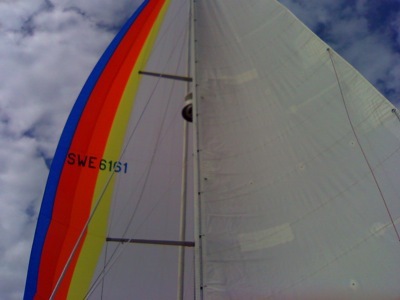 When we got out into Albemarle Sound, Lee proposed that we set the spinnaker. This has been an obsession of his ever since we got the boat. When are we going to fly the spinnaker? How exactly would be rig it? What kind of conditions would be good? Do we need more people? How fast would we go? There have been lots of spinnaker discussions. Yesterday was the day to give it a go. The sound was flat. There were no other boats around. The wind was coming over our stern quarter at 8-10 knots. We raised the main and shut off the engine. I rigged the sheets, squeezed the bulky spinnaker out of the aft cabin and up on deck. We set up the pole, something we’ve practiced a lot with poling out the jib, attached the halyard, and double checked everything. I reviewed the procedure for setting the chute with Lee, who has only used one once (with his dad and me on the Sylph). It was very intimidating to be the one who supposedly knew what I was doing, even though I’m used to being part of a full racing crew when doing this kind of activity. I pre-fed the guy. Lee jumped the halyard while I tailed and then jumped to the cockpit to trim the sheet and guy. It was up! Pirat instantly picked up speed with the billowy, rainbow-colored kite pulling her downwind. We adjusted the pole height, and I instantly fell into the rhythm of trimming, something I’ve always enjoyed. It was a beautiful, triumphant moment! Lee snapped a few pictures with his phone to document our accomplishment. We cruised downwind for an hour or so, reaching around 5.5 knots in 7-8 knots of wind. Not bad for a couple people on a loaded down old racing boat. 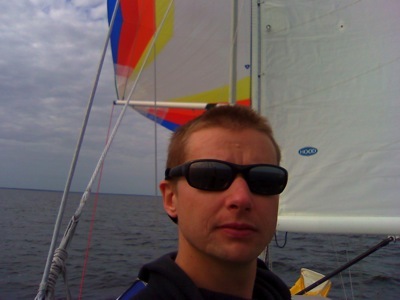 Lee is such a ham, taking picture of himself with the sail! Eventually the time came to drop the chute, something I’d been dreading. I pictured it wrapping around the forestay or going in the water because I couldn’t gather it up fast enough. It did neither. We were sailing a little by-the-lee (past dead down wind in the wrong direction) so instead of just being blanketed by the main, the spinnaker kind of backwinded into the pole. Lee manned the halyard and I managed to get the on deck without any trouble. It was the kind of thing that would not have worked with more wind. We finished the day with a little wing n’wing sailing while I started working on Thanksgiving dinner. We motored into Elizabeth City around 3:30. The free slips were a bit sketchy but Lee did a masterful job docking. I went into high-gear on dinner and Lee busted out the barbecue for his turkey breast. People kept stopping by to talk to us – random locals as well as a guy from a trimaran around the corner. He and his wife are inexperienced sailors heading South too! Hopefully we get to talk to them again today. The turkey breast-roast (that’s what Butterball calls it) took a while on the barbecue but Lee did an awesome job with it. It smelled and looked sooooo good…I almost wanted to try some. We sat down for our first Thanksgiving dinner on our own, away from family, and carried on the Magnusson tradition of saying what we’re thankful for. The list is long and somewhat corny. I won’t bore you. Our feast included delicatta squash stuffed with my own invented bulgar stuffing, roasted green beans and potatoes, rutabegga that accidentally ended up really, really tasty (I followed to recipe and just cooked it off and on till the turkey was done), homemade cranberry conserve, and of course BBQ’d turkey and gravy. Not bad for Thanksgiving on a boat, huh? We fell into deep food comas afterwards but I was awake enough to make rendezvous plans with Sarah! She and Derek and Derek’s dad are coming on Saturday morning so we’re in for a fun weekend with friends! We’re finally getting ready for a sail to a little island off Malaysia next week, cant wait! hehe – that gave me a good laugh. Doug, you should just wear those goggles all the time. Your voyage sounds exotic and exciting! I can’t wait to hear about it! Wow, spinnaker looks awesome. Congrats on a successful first spinnaker raising! Also, happy Thanksgiving to you both! Your dinner sounds great. Doug and I celebrated by installing an oven all day. With luck there are pies in our future. You’d better learn to bake pies in that awesome little oven! I’ve never thought of it that way before…weird! Thank you! I hope you had a pleasant Thanksgiving, if you decided to celebrate the American holiday. I was thinking the same as Danielle… but he’s one of the few Americans who can boast that his name has a meaning. And glad your T Day was pleasantly eventful! Oh thank you. It has been nice to get a break from disasters for a while.